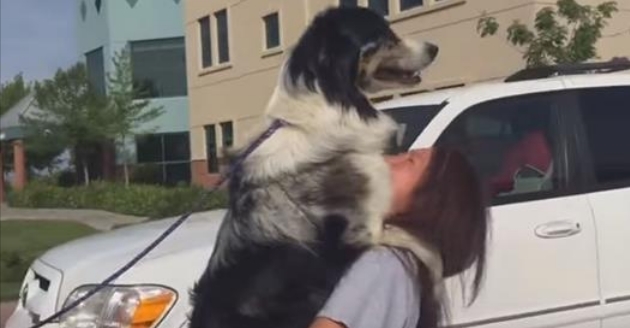 Titan had been separated from his owner for two whole years — but he never forgot how to hug. In a video posted to YouTube last week, Angelina Chastain and her long-lost pet are seen in one appropriately epic embrace. It's the kind of hug that was years in the making, according to the KMPH Fox 26 report. Chastain had owned Titan since he was puppy. But two years ago, he ran away from the family's backyard in Fresno, California. No collar. No microchip. Despite a frantic search that spanned not only the neighborhood but also social media, Titan wasn't seen again — until someone posted pictures of an abandoned dog in a Facebook group called Fresno Lost/Found Pets and Homeless Animals. Responses to "Dog Shows His Owner Just How Much He Missed Her"